[Update] I had previously linked to Christian Legnitto’s personal github repo. The correct canonical github repo is https://github.com/mozilla/mediawiki-bugzilla. 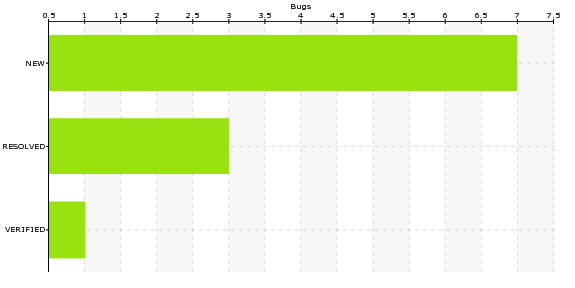 Keep your feature pages up-to-date by embedding live bug data to show real time status of related bugs. See the development sections of the Silent Update: Removal of OS security dialog for Windows and Silent Update: Background updates feature pages for live samples. Keep project pages current by automatically pulling bug lists and show a rolled up view of status via charts. See the project Snappy page for an example use of charts. You can also setup personal and team work pages with custom views of bug data and create kanban style and other dashboards. Further information and examples are available in the readme. Data is pulled anonymously. There is no way to pull private bugzilla data including security and other confidential bugs. There is no current way to specify multiple values for parameters (like status) that require multiple query parameters in the bugzilla api (bug 729259). Only bar charts are currently supported. Data that exceeds the wikimedia memory limit will result in a blank page. The readme has instructions on recovering from this scenario. Thanks to Christian Legnitto for kicking off this project last summer and Brandon Savage and Jake Maul for getting the code into a production ready state and deployed on wikimo. Bugs can be filed here. If you’re interested in contributing to this extension or using it with your own mediawiki installation, you can find the source on github. This entry was posted in mozilla and tagged bugzilla, mozilla, wiki. Bookmark the permalink. What I’d like to see is links to bugzilla in the wiki that just have the number as the text of the link get their title=”” attribute automatically populated with the bug summary like links in bugzilla itself. The links on the summary of bugs in the table don’t point to the individual bugs for me, instead to the current page. BlueMM: I actually started to work on that but ran into some Mediawiki issues…hope to pick it up again soon. I had also started working on a live bugs implementation that would do as Mardeg and BlueMM suggest as well as show bug status with a strike through for resolved bugs. I’d like to get to that as soon as we sort out some of the issues with the current table and charting integration. Pingback: Long time no see! « LegNeato!